As Zach and I made our way over the footbridge in Georgetown, we wondered what this night had in store. From the intriguing emails to the impressive list of thought leaders booked for the night, TableTribes had succeeded in garnering our attention. Although billed as an outdoor summer picnic, the email confirmation indicated that this particular event would be indoors due to the impending storms. At the bottom of the footbridge, we approached a well-dressed man wearing a red blazer who I was fairly certain was here for this event. He remarked that he was and, in fact, was one of the speakers so he had come outside to take a breath during "the calm before the storm," as he described it. He pointed to a building and said the event would be held in there so we made our way over. As we peeked inside, we immediately wondered if we had the right place. At first glance, it appeared to be an abandoned building with unfinished floors and brick walls, but once we saw a stylish bartender setting up his bar, we knew we had found the right place. TableTribes is a summer picnic series that aims to be "a communal exploration of The Human Condition." The Founder, Hosan Lee, was one of the co-collaborators for the No. 68 Project, one of the most unique dinner series that ever made its way through DC. Now she has created a series with a different focus -- while the focus of the No. 68 Project was elegant food with interesting conversation, the focus of TableTribes is more on the conversation itself. As we walked up the stairs to the first level, we grabbed a drink from the mixologist, JP Caceres, a gin expert who works part-time at Bourbon Steak in DC. He called this drink "Remember Me?" 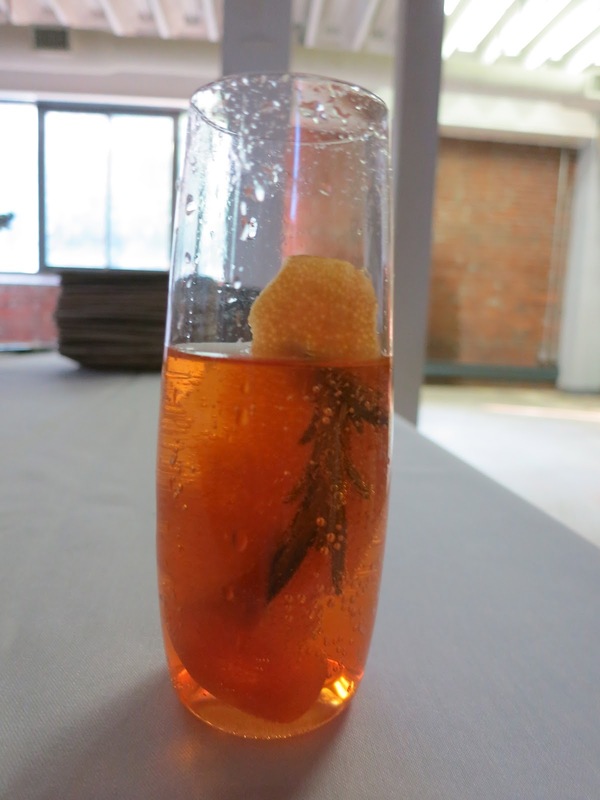 as it had Aperol Apertif fast infused rosemary -- rosemary helps improve memory. Clever name. We said "hello" to Hosan then made our way around the room to strike up a conversation with whomever seemed interested while listening to the sounds of a live musical artist and singer. The meal was provided by the Tapas Truck, a food truck in DC. All of the vegans, however, had a special vegetable plate prepared by Bodega, a Spanish tapas restaurant in Georgetown. Once we had our food and drinks, we headed upstairs where a virtual picnic awaited us. I could have never imagined the transformation of this warehouse into an intimate picnic complete with faux grass, blankets, and candlelight. We chose a blanket and took a seat realizing that the night had only just begun. From that point on, we enjoyed stimulating conversation with the individuals at our blanket, all of whom had been personally invited. The conversation was facilitated by several thought leaders including Robert Egger, Founder of DC Central Kitchen, who spoke about relentless incrementalism and Paul Kruchoski, Senior Education Officer in the US Department of State's Bureau of International Organization Affairs, who said that his goal every day is to make someone else's day better because of what he does. I, too, strive for that. The topic for the evening was Order and how we make sense of the world around us. After each inspiring speaker, we would discuss the topics over yet another refreshing medicinal cocktail. By the end of the night, I had met some incredibly interesting people who all had good reasons for being there. As it is an invitation-only event, one must request an invitation by answering a number of obscure questions online like "What does your life taste like as a pie?" If approved, an invitation is sent allowing you to register for one event. This nine-week series commenced on June 24 and will continue on Sunday nights through August 26. To request an invitation, click here. TableTribes succeeded in bringing together people who might not normally cross paths and gave us all something to think about on the way home. 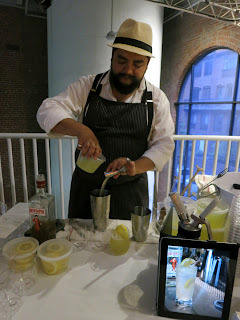 Of all the people who spoke that night, I most appreciated the humbleness of our mixologist, JP, as he said, "I drink for a living and get paid for that." If only we all could be so lucky.